Tonight in institute we talked about strings. The instructor gave an example of a sapling in a windy environment. If that sapling has a small string tied around it to guide its growth, it will grow up straight despite the blowing wind. If that string isn’t there from the tree’s young age, however, the tree will grow in the direction of the wind, slanted in the same direction, and only drastic, destructive measures will be able to change the grown tree to make it upright. This story illustrates the importance of the proverb “Train up a child in the way he should go: and when he is old, he will not depart from it.” (Prov. 22:6) At a young age, when the clay is malleable, it is best to being training and teaching what truly is important. The instructor mentioned five “strings of protection” in our own life, pulling examples from the book of Judges. When the children of Israel were allowed to enter the promised land, they were commanded to destroy its inhabitants due to their wickedness adn idolatry. Instead of complying, they didn’t drive them out and instead “dwelt among them”. As a result, the Israelites were surrounded by those of another faith whose practices and lifestyles consisted of behavior expressly forbidden by God. Since we as humans are a product of what we surround ourselves with, it was inevitable that the Israelites become influenced by their neighbors. Indeed, they became a thorn and a snare to God’s people. Just as a thorn stops you in your tracks, the lifestyle and morals of these idolatrous and wicked people stopped the progression of God’s people. Are there things in your life that you need to drive out of your environment, so it is safe? Like the children in King Benjamin’s era, the children of those who moved into the Promised Land rebelled against the teachings of their parents. They forsook the God of their fathers, the way of their fathers, their covenants, and their walk. Have you forsaken something that is of importance and precious to your family? The example for this “string” was Deborah the prophetess and Jael, who slayed Sisera (befriending the Israelites and supporting their cause). These friendships passed the test of adversity and showed where their true characters lie. The Book of Mormon also has couple examples  of the power of women. The story of Gideon’s army was used in this example to show a dependence upon and faith in God. God asks us to do large (and seemingly insurmountable) tasks that we might have faith in Him and rely upon His arm, and not the “arm of flesh”. Do we need to have faith in God that he’ll help us get dressed in the morning? No, that’s not hard to do. Do we need to have faith that a wayward child will return to the fold someday? Yes. If the challenges are not hard, we will not have to exercise faith. Gideon learned this lesson by defeating an army 450 times the size of his. We didn’t get time to cover this last “string”, but I’ve previously posted about the power of making covenants, and it should be obvious how making covenants can be a supporting string to foster righteous growth in people of all ages. 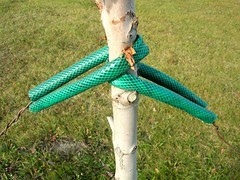 These strings have the greatest effect when the tree (or person) is young and “bendable”. When the winds of society and culture have blown upon the tree (or person) for a long time, that tree (or person) leans in the same direction and solidifies its position more and more.